What is a DUI in Washington State? In Washington State a DUI can by charged under two separate statutes, the driving under the influence statute and the actual physical control while under the influence statute. Being convicted of either you may face the same penalties. Each statute can be prosecuted in two different ways: Driving or having actually physical control of a vehicle under the influence or affected by, intoxicating liquor or drug or both and/or have sufficient alcohol in your body to have an alcohol concentration of .08 or higher. doubt that on or about a certain date in the relevant jurisdiction that you drove a motor vehicle within the State of Washington and while driving the motor vehicle you were under the influence or affected by, intoxicating liquor or a drug; or under a combined influence of, or affected by intoxicating liquor or drug; or has sufficient alcohol in your body to have an alcohol concentration of .080 or higher within two hours. were under the influence or affected by, intoxicating liquor or a drug; or under a combined influence of, or affected by intoxicating liquor or drug; or has sufficient alcohol in your body to have an alcohol concentration of .080 or higher within two hours. It is an affirmative defense to the .080 prong if you prove by a preponderance of the evidence that you consumed enough alcohol after driving or having actual physical control of the vehicle and before the breath or blood test to cause your alcohol concentration to be 0.08 or more within two hours. What is preponderance of the evidence? The evidence which, when fairly considered, produces the stronger impression, has the greater weight, and is the more convincing as to its truth when weighted against the evidence in opposition thereto (Not beyond a reasonable doubt). What is physical control in Washington? Needs to be analyzed case by case, but it is possible to be charge and convicted without the car moving and/or even being the driver (examples: passed out with keys in the ignition, passenger grabbing the wheel, etc…). the process. 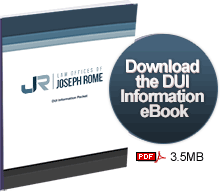 Please feel free to contact The Law Office of Joseph Rome at your earliest convenience or call (425) 429-1729 to speak to a Washington DUI Attorney.